This streaming box bridges the gap between TV and PC, and most of the time, does so with finesse. It's easy to setup and use, however, only those with a gutsy gaming PC and the right networking gear need apply. When we spoke with Valve CEO, Gabe Newell, at GDC 2015, he illustrated the company's multi-faceted initiative to rob the console of its TV rights in terms of what's "good, better, best" for gamers. The "better" and "best" scenarios can be achieved by plopping down $449 (about £297, AU$637, though official pricing outside of the US has yet to be announced) on a mid-range Steam Machine from Alienware, or up to $4,999 (about £3311, AU$7093) on a high-end model pieced together by boutique PC manufacturers, like Gigabyte, Falcon Northwest, Origin and Digital Storm. Each console-sized machine will get you in the door with SteamOS, the Linux-based operating system built to keep you locked inside of Valve's ecosystem. At the bottom of the totem pole - what Newell called the "good" option - is Valve's own creation, the $50 (£38, about AU$69, but won't be made available outside the US, Canada, UK and Europe until 2016) Steam Link. It's a small, unassuming slab of black plastic that, for some, is actually a better choice than the more fully featured (and more expensive) Steam Machines. While it might be similar in name to its SteamOS-packing comrades, its duties on the frontline in your living room (or wherever you enjoy watching TV) are very different. The Link is strictly a game streaming box that acts as - you guessed it - a link between your computer and TV. Despite being positioned as the lowly "good" option, it deserves more credit than that. When used under ideal conditions, the Steam Link not only stands out as the most affordable of Valve's fleet, but also as the only one that caters to Steam's loyal customer base, which is largely made up of those who already have a capable gaming PC and networking router or switch. The Steam Link is making its entrance during a time when real estate on our entertainment center has never been more of a precious commodity. Set-top boxes are fighting each other for a spot, but Valve's streamer does what most others cannot. As a result, it could very easily slip past the scuffle and make a home for itself in your living room. For comparison's sake, this game streaming device isn't all that much different in appearance to recent, popular streaming boxes like the Amazon Fire TV or the new Apple TV. Each is no bigger in size than most modern portable hard drives and weighs just about as much a smartphone or two stacked together. And while Amazon and Apple's offerings might have Valve's box beat in terms of the devices' vast multimedia catalogs, the Steam Link totally cleans the floor of the competition with its own expansive game selection. It can stream any (read: any) game in your computer's Steam library over a wired or wireless local connection. Digging in a little more on the Link's looks, it's a modestly built device, clad in plastic on all sides. Valve spices things up visually with a matte texture on its top and a ring of gloss around its sides. Sure, the design of the unit can generally be described as "boxy": three of its corners come to a sharp point, but one is stylishly rounded-off. The Steam logo is stamped in discreet fashion on top of this rounded edge. On its back, you'll find a lineup of ports. There are two USB 2.0 ports, an ethernet jack, HDMI-out and a spot to plug in the AC adapter. Around the corner, Valve stuck on an extra USB 2.0 port for good measure. The Steam Link is padded with rubber footing on its bottom to help give it some traction on your entertainment center, or wherever you place it. Inside the box, Valve includes everything you need to get started. Aside from the Link itself, there's a power adapter, as well as an HDMI cable, an ethernet cable and some universal plug adapters (types C, I and G are included). Steam isn't known for being the most user-friendly application out there, but it's gotten remarkably easier to use in the past few years. That's mostly due in part to its Big Picture feature, Valve's controller and TV-friendly interface that gives gamers a slick, refined view of the Steam universe. Anyone who is comfortable navigating Netflix should feel right at home here. From the time I powered on Steam Link to when I began playing only took a few minutes. That said, there are a few initial steps to run through. Whether you have Valve's official Steam Controller, a trusty wired or wireless Xbox 360 controller, or just a standard keyboard and mouse combo, setup is simple and intuitive for beginners and experts alike. Xbox One controllers will work, too, but only when wired up to the Link. On the controller selection screen, the Steam Link passed my first test: it instantly recognized my third-party wireless Xbox 360 controller receiver, the same one that once stumped my computer into a driver-seeking frenzy for a few minutes. Next, I tried connecting a Steam Controller, and, to no surprise, it worked like a charm. Also, thanks to the Link's Bluetooth support, I was able to have a wireless keyboard and mouse, as well as two wireless controllers, connected simultaneously while only using up one of the USB ports. However, pairing a Bluetooth headset, or plugging one in directly to the Link, is just outside the reach of what's possible right now. Thankfully, we've received confirmation from Valve that these features will be coming soon down the line. The next step involves connecting the Steam Link to the same home network that your computer is running off of. Valve strongly recommends tethering an ethernet cable to the Link, and after some rough experience streaming games over my Wi-Fi connection, I wholeheartedly agree. On the other hand, if you have high-end router that's capable of 802.11ac (which I do not), I'd definitely opt for the wireless route. Either way you go about it, getting the Link onto your network requires no more effort than plugging in a cable or putting in your Wi-Fi password. From there, you can take time to tweak the streaming quality (between Beautiful, Balanced, or Fast settings). The last step before you get comfortable on the couch is making sure that the host PC is running Steam (this is a must, each and every time you want to stream). 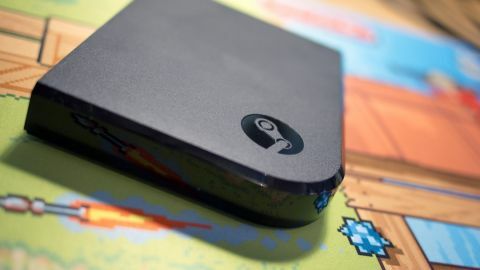 Once the Steam Link establishes a connection for the first time, it will spit out a four-digit code to authenticate the tether between the two. From there, you're all set. This might have seemed more complicated than what I had led on, but it takes far less time than initiating an Xbox One out of the box.